Consolidated-Tomoka (CTO, $53.25) is a diversified real estate company based in Daytona Beach, FL where most of its operations are. 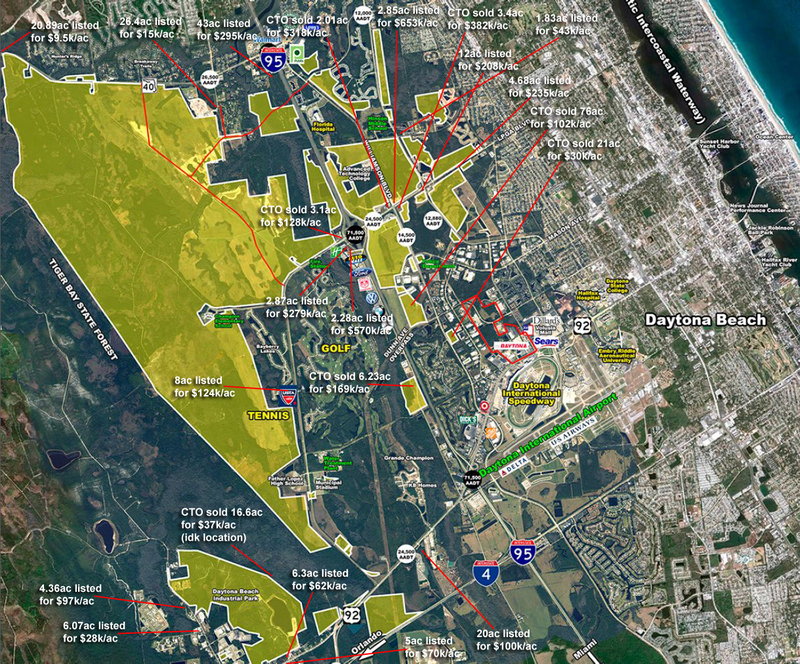 CTO owns quite a few different assets which I’ll get into below, but their two main assets are 10,500 acres of raw land in Daytona Beach and 43 income-producing properties (mostly single-tenant retail buildings and multi-tenant office buildings). Management’s stated goal is to sell off the 10,500 acres of land and use the proceeds to purchase more income-producing properties. It is extremely difficult as an outside investor (especially one who hasn’t been to Daytona in years) to accurately estimate what their land is worth, but even the most conservative assumptions put the value of the company above what the market is valuing it at today. I know I’ve only given a very brief summary of what they do (although it’s real estate, not rocket science), but I want to start with an overview of the management team because they are crucial to the story. John Albright, CEO, took over in August 2011. Prior to Consolidated-Tomoka, Albright was the co-head of Archon Capital, a real estate investment subsidiary of Goldman Sachs. Smart? Check. Knows real estate? Check. During his days at Archon he personally invested in CTO and followed the company for many years. When CTO’s board was looking for a new CEO in 2011, Albright wrote them a letter detailing ways to unlock shareholder value. The board clearly liked his ideas because they hired him shortly thereafter. A few of his initial changes were terminating the company’s pension plan, deferred compensation plan and executive perks (car, golf club membership) and changing the 401k plan. The board has also been decreased from eleven members prior to his arrival to the seven that it is now. All directors are required to own at least 1,000 shares of CTO stock and they’re not allowed to hedge against it. When Albright was hired, he received 50,000 shares over three years and an additional 96,000 shares that vest(ed) in 16,000 share increments based on stock prices ranging from $36 up to $65 (so the majority of these have vested). In May 2015 he was granted 94,000 more shares that vest over a range of share prices starting at $60 up to $90. Motivated by stock price? Check. He also receives much smaller yearly grants based on performance. Currently he owns 168,762 shares worth $9.4 million which is equivalent to 9.6x his total 2014 compensation. More importantly, if he performs and gets CTO’s stock price to $90, just these stock grants will be worth over $21 million. Interestingly, in 2014 he pledged 76,600 of his shares for an $812,000 line of credit. This leads me to believe his CTO stock is the vast majority of his net worth. If he had $10 million sitting in his bank account he wouldn’t need to pledge his shares for a line of credit. CFO Mark Patten and General Counsel Dan Smith both have stock option packages very similar to Albright’s (though in much smaller quantities). Consolidated-Tomoka doesn’t host conference calls which I’m sure irks some investors, but Albright’s annual letters make up for it. He’s only been here a few years but his letters are extremely informative and not filled with useless platitudes like so many shareholder letters. It is clear he understands capital allocation and that he has a vision for this company. So far he has done exactly what he’s said he’s going to do (mainly sell land and acquire income-producing properties while opportunistically seeking other investments). In his short tenure he’s found some very lucrative investments. In late 2013 CTO purchased preferred stock in a public REIT that earned them a 25% IRR. In 2014 they purchased a building for near land value from a large public REIT that had basically left it to waste. Albright’s also made several commercial loan investments that all seem excellent (one earned a 39% IRR in early 2014, another is a 12% fixed rate performing loan purchased at par). None of these investments have a huge effect on the bottom line, but it’s clear Albright is adept at finding deals that would make Warren Buffett proud. 43 income-producing properties consisting of 38 single and multi-tenant properties and five self-developed office buildings. Three commercial loans with a total carrying value of just under $24 million. All three loans are performing with a weighted average coupon rate of 8.5%. 10,500 acres of raw land. I’m going to spend a lot of time detailing this land so right now I’ll just say 1,900 of these acres are under contract for $82 million (or an average of $43k/acre). LPGA International golf club which consists of two 18-hole golf courses, a restaurant and a brand new fitness facility. Agricultural: Raw land is managed by a third party that leases it out for hay production, timber harvesting and hunting. 21 billboards that they lease to third parties. Subsurface rights to 490,000 surface acres of land. They lease the subsurface rights to mineral exploration companies. Currently only 43,000 acres are under lease. Thankfully (for the sake of this post’s length), only two of these assets really have a meaningful impact on the value of the company: income-producing properties and real estate (the 10,500 acres of raw land). I’ll mostly ignore the other assets the rest of this post. Consolidated-Tomoka refers to their raw land in three different segments which are shown on the below map (click to enlarge). The yellow section in the bottom left corner is 900 acres and is referred to as industrial land. They define the other 9,600 acres by whether it falls on the east or west side of I-95 (the main highway that runs north and south in the middle of the map). The 8,200 acres to the west are residential and the 1,400 acres to the east are commercial. The above map also shows the 1,900 acres that are under contract, including the largest section of 1,600 acres being sold to Minto Communities. Minto is planning to build over 3,000 homes in this community which will not only increase the value of the surrounding residential land, but it will also bring many new memberships to the LPGA International golf club (which is operating close to breakeven right now). Another note on the above map: you’ll notice much of their land is located right off I-95 and just to the north of the I-95/I-4 intersection. This is a very strategic location for distribution centers and warehouses. Taking I-95 north gets you to Jacksonville in 1.5 hours and south takes you to Palm Beach in three hours and down to Miami in four. I-4 to the southwest gets to Orlando in an hour and Tampa in 2.5. This easy access to almost the entire state of Florida is why Trader Joe’s recently purchased 76 acres from Consolidated-Tomoka to build a distribution center on. Albright has been in talks with several other companies about putting distribution centers in this same area. As stated before, Albright is focused on selling off their raw land and using the proceeds to buy (or build) income-producing properties. US GAAP accounting rules dictate that land must be stated at its historical cost on the balance sheet. Since Consolidated-Tomoka has been a land owner for over 100 years, much of their acreage is on the books for a very small amount compared to what it’s worth now. Because of this low cost basis for their land holdings, one would think that disposing of this land would create large taxable gains. Luckily there’s a bit of a loophole they can take advantage of. They’re able to utilize what’s called a like-kind exchange under Section 1031 of the Internal Revenue Code to purchase income properties with their land sale proceeds. This defers the income taxes on the large taxable gains from the land sales so they’re able to reinvest nearly all of the net sales proceeds into income-producing properties. The icing on the cake is that these deferred tax liabilities (which are currently building up on the balance sheet) are erased if they transition to a real estate investment trust (REIT). Earlier this year Albright announced their intention to do just that as early as January 2017. Daytona is undergoing explosive growth in the past couple years and a lot of it is right around where Consolidated-Tomoka’s land is located. As you probably know, Daytona is home to arguably the most popular NASCAR race of the year—the Daytona 500. Daytona International Speedway is currently undergoing $400 million worth of renovations, in addition to the 180-acre ONE Daytona development happening across the street. This is an entertainment district with restaurants, retail, hotels and residential which will be anchored by Bass Pro Shops and Cobb Theater. A little to the north, the city recently approved construction of the Tomoka Town Center which includes a Tanger Outlet Mall and Sam’s Club. As Daytona continues to grow in popularity, a bit of a network effect on CTO’s remaining land begins to develop. All the developments I’ve mentioned (Trader Joe’s distribution facility, a 3,000 home community on the golf course, ONE Daytona and Tomoka Town Center) make Daytona a more attractive area for businesses and individuals to move to. The more attractive Daytona is, the more valuable CTO’s land is which means more land sales. As land is sold, the supply of available land decreases, thus increasing the value of the unsold land. Importantly, the local government is very much in support of developing Daytona and they are well aware of the role that Consolidated-Tomoka plays in this. Volusia County (where Daytona is located) has donated millions of dollars to several development projects to attract businesses. They’ve also publicly complimented Albright and the job he’s done bringing companies to the area. Daytona Beach Chamber of Commerce awarded Consolidated-Tomoka with its Enterprise Award in 2014. CTO converting to a REIT in a year and a half is a major catalyst. I won’t bore you with the details, but a REIT basically means that a company holds at least 75% of its assets in real estate, earns at least 75% of its income from real estate sources and pays out at least 90% of its taxable income each year to shareholders. Since the vast majority of taxable income is distributed to shareholders, REITs don’t pay federal or state taxes. In addition to the tax efficient structure, REITs are also popular investment vehicles because they offer the benefits of real estate ownership without the headaches. Converting to a REIT would attract a whole new class of interested shareholders (including REIT index funds and ETFs). REIT conversion also makes sense because selling their land creates large amounts of deferred taxes and they’d rather pay that money to shareholders and not the government. Consolidated-Tomoka is highly susceptible to a real estate/housing decline. Another 2009 would certainly hurt the stock, though I don’t think it would permanently impair the value of their land. This would make it harder to sell land in the short-term though. As I discussed in my LGIH write-up, macroeconomic signs point to a continued recovery in the real estate market and overall economy. The company is beginning to diversify outside of Daytona but for the foreseeable future their results are highly dependent on that local market. If the city’s growth flutters, CTO will suffer. One reason that investors may currently be turned off by CTO is how volatile their quarterly results are. A large percentage of their revenue is from land sales which are highly variable. Land sale discussions and negotiations to due diligence and closing can take anywhere from months to years. One quarter they may sell zero acres and the next they could sell tens of millions worth of land. It’s important to note however that Albright is very focused on land sales. The company wasn’t selling any land before he arrived and now they have 1,900 acres under contract. Another risk with Albright is what’s referred to as key man risk. Essentially he has been so vital to this company’s turnaround that (God forbid) something happen to him there’s no guarantee the next CEO could continue his performance. To some extent this risk is inherent in all companies. The real estate industry is also very capital-intensive (buying new property isn’t cheap). If they’re unable to sell land as quick as they want to expand their property portfolio, they will have to issue debt or equity. Below is a similar map (click to enlarge) to the one I showed above, but this one I have marked up with local land sales and listings (from CTO and others). Listings should be taken with a grain of salt because we don’t know the final sale price, but they still help us triangulate what comparable land is going for. These are the numbers I’ve used in the right column (labeled Realistic) of the below valuation table. The left column is an example of what the land and income properties would have to be worth to equal today’s enterprise value. 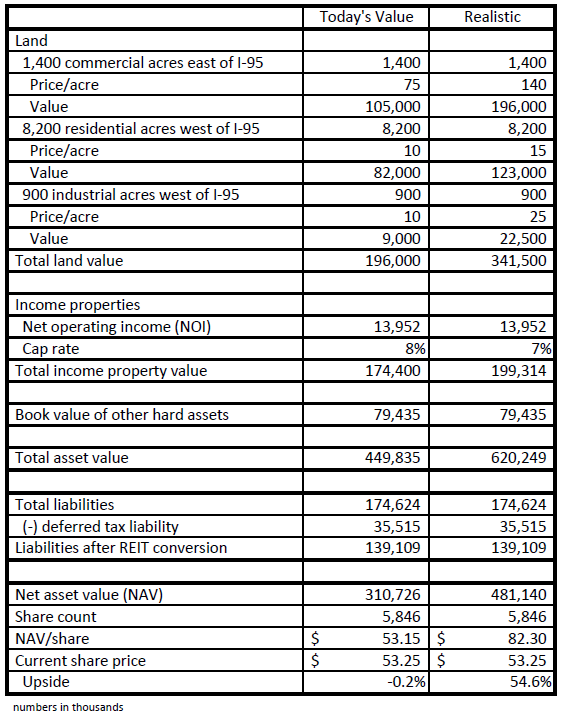 Since land and income properties are by far the most important aspects of this valuation, I’ve valued the rest of their assets and liabilities at book value. I think this is very conservative as it doesn’t include timber and subsurface assets and the value of LPGA International should be increasing (I’ve also left out intangibles and some land development assets that are essentially deferred cost of goods sold). You’ll see I subtracted out the deferred tax liability because they are planning a REIT conversion which will wipe these off the balance sheet. I’m not sure what the upside is, but I’m confident the downside is basically non-existent. Looking at the left column, to get a fair value equal to today’s price requires putting some absolutely absurd values on their portfolio—8% cap rate on income properties, $10,000/ac on all land west of I-95 and $75,000/acre on land east of I-95. CTO has been written up quite a few times around the Internet by different investors and it amazes me how much the estimated fair values range for its stock price. I’ve seen as low as $70 and as high as $250 in an “all things going well” scenario. There are two main reasons the fair value ranges are so wide. First, no one knows what their portfolio of income properties would go for in a sale. I’ve seen cap rate estimates ranging from 8% to under 6% and this simple change affects the value of the company by $70 million! That’s quite significant compared to an enterprise value of $425 million. If you don’t know what a cap rate is, it’s a common way to value real estate properties. You divide the property’s net operating income by a cap rate and that gives an estimate of that property’s value. So a lower cap rate means the property is worth a higher multiple with respect to how much money it earns (similar to a high price/earnings ratio). Cap rates vary by market, investor sentiment, economic health and outlook, etc. Second, no one knows the true value of the company’s 10,500 acres. I’ve spent many hours combing through Daytona land sales to get an idea of what nearby land is selling for, but the reality is that every piece of land is different. The value of this remaining land is also constantly changing. 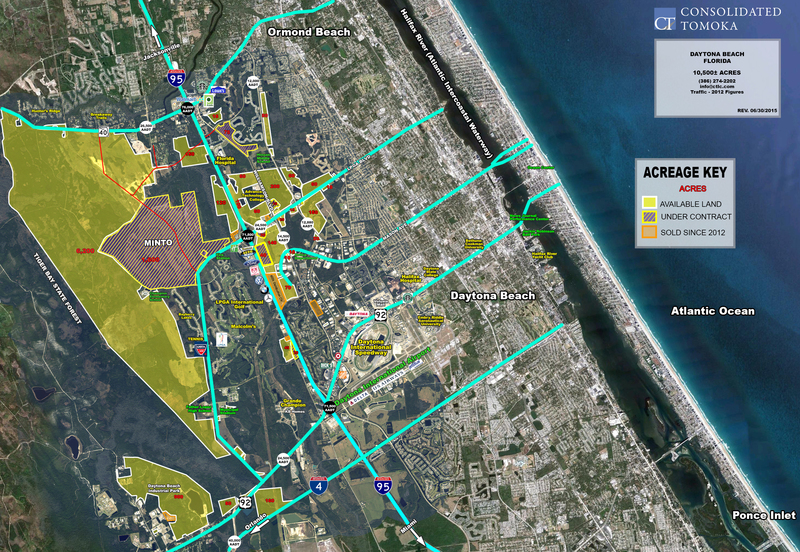 As stated before, as Daytona grows the undeveloped land becomes more valuable. And as land is sold, supply decreases which pushes up prices. On the other hand, it’s a reasonable assumption that the best (i.e. most valuable) land is sold first and the less desirable land is what’s left. I’m not sure how these (and other) factors play into each other. From their previous land sales and other sales in the area, I’m confident $75,000/acre for the land east of I-95 and $10,000/acre for the land west is far too cheap. More importantly than what exactly the land is worth and what the correct cap rate should be, is the management team. John Albright has been a fantastic CEO in his short time at CTO and has done exactly what he’s said he’s going to do. Just reading his annual letters you can tell he understands capital allocation and his stock price-based bonus aligns him perfectly with shareholders. Some of the deals he’s found so far have been quite impressive (12% fixed rate on a performing loan purchased at pair, $2.1 million dollar return in five months on a $17.5 million dollar investment). Albright has proven he is motivated to sell land and improve long-term returns by focusing on assets that produce steady income. If CTO evolves into purely a manager of income producing properties, then at a cap rate of 8% they need $38 million in net operating income to equal the current enterprise value. A cap rate of 6% requires only $28.5 million in net operating income to get there. With their trailing twelve month net operating income from income producing properties at almost $14 million, this should not be a difficult task. Remember, they have land worth hundreds of millions of dollars and their sole intention right now is to sell this land and use the (tax-free) proceeds to purchase or develop income producing properties. Converting to a REIT will be icing on the cake. The 54.6% upside shown in the valuation table above is what the company might be conservatively worth today, but I really think the upside is much more than that. First off, valuing their income properties at a cap rate of 6% (or even lower) substantially increases the value of the company. Second, converting to a REIT will not only put a premium on the stock price but it will also bring the company onto the radars of many institutional (and REIT-focused) investors. Consolidated-Tomoka is relatively unknown right now but as Albright continues to perform and its real estate property grows, so too will its popularity as an investment. it seems that value investors have a curious predisposition to look for value traps. and it basically means that the price (they supposedly don’t even care of) has nothing to go but downwards. Recent short-term price volatility has nothing to do with there being very little downside long-term. And while I don’t know MHGC well, there are a lot of differences between what’s going on there and with CTO. Anyway you can’t deny that the company’s share price had already suffered to some extent. MHGC is indeed a heavily indebted company overloaded with specific problems, however solely on the basis of the high value of its assets it was viewed by many as the sure bet. Kerrisdale capital in particular accumulated a position in 2013 and is still holding it seems. My point was that the strategic alternatives review for the companies operating in this sector may be subjected to many unexpected delays. The outrigt cancellation of the original plan will not surprise me as well (see NYRT) It also a bit puzzles me that the supposed buyers were never named as if it is implied that where is a plethora of them. but who can it be? $MHGC is a good illustrative case of what may happen here.